Some years ago, I landed a job as a lead carpenter for a construction company in Northern Virginia. 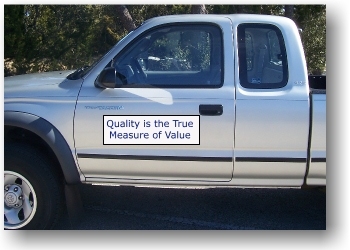 The owner of the company had a magnetic sign stuck to the door of one of his trucks that read Quality is the True Measure of Value. Over the years, I'd seen many such signs on the sides of service vehicles, but never gave them much thought - just more of the same old over-used empty banal phrases that we too often see and hear. On a job site a few months later, I was leaning up against a tree having lunch and saw the truck again - Quality is the True Measure of Value. I thought about that statement for a while and a few questions came to mind. How did they measure quality? How did they manage it? How did they know that they had hired someone who cared about quality? I suppose that they planned to manage the quality themselves by being on site often enough to spot and correct poor workmanship. That made sense to me - I had managed quality this way on my own projects. Perhaps being on site once a day to review the day's schedule with the lead carpenter is often enough - discuss what is being built and the techniques that will be used to build it. By doing this, as manager of quality, you can get a feel for the confidence level of your workers, and whether or not you should return later in the day to see how things are going. Managing quality is easy when you have good people working for you, though they aren't always easy to find. When I interview someone for any position, I look for signs that they are knowledgeable and experienced, but what I look for most is that they care about the work they do. I like to see pride in their faces when they show me pictures of their work or feel their enthusiasm when they talk about something they have built. If I can sense that they really like what they do, I know they will be good quality workers. I hope that is what my boss was thinking when he made the decision to hire me. I have worked on many blow-and-go framing crews. "Nail it!" yelled one foreman, after he saw the puzzled look on my face, when he handed me a board that was obviously cut way too short. If something wasn't built quite right, it would likely not be fixed unless the building inspector caught the error and made us rip it out. The foreman justified the poor workmanship with, "We only get paid to do this job once." The foreman was right about one thing, we didn't get paid to do the job more than once, so why not put in the effort to do the job right in the beginning. No quality-minded carpenter wants to work for some nail-it! fool who cares so much about doing things fast that he sacrifices quality, and pride in a job well done, for shotty productivity; the kind of productivity that produces the sort of mediocre work that has to be torn down and rebuilt from scratch. But the second time, built with a less-than-great attitude and under pressure to do it even faster because now the job is behind schedule. I've never been known for my super-fast framing skills, but one of my former bosses said this about my work, "It may be fast, it may be slow, but it is always right." At the moment of that recognition, I felt something I had never felt before - someone understood me as an ethical quality minded carpenter that cared about his work. Wow! As those thoughts coalesced in my mind the rest of the afternoon, I knew that from that moment on I would have to live up to those expectations on every future project. No problem. A short time later, I began reading books about architecture and design. It wasn't long before I was designing and drawing blueprints for all of my projects. Not everyone can design or build a quality product without some training and experience, but almost everyone can recognize top quality and work when they see it.